The VSS silent rifle, which is called the thread cutter, is considered the best weapon for special operations. Since its inception in 1983, the special sniping rifle has firmly taken its place in the arsenal of special units, ranging from GRU (Main Intelligence Directorate) special purpose teams to the CSN (Centre for Special Operations) of the Federal Security Service (FSB). The Vintorez or the VSS, previously only available to elite Special Forces intelligence officers, is now being delivered to army scouts. By the early 1980s, silent pistols based on the Makarov pistol (PM) and the APB (automatic silenced pistol) based on the Stechkin automatic pistol (APS), as well as the AKM (Kalashnikov modernized automatic rifle) and its successor the AKMS, which is equipped with the PBS-1 silent fire device, have become the most widespread examples of silent small arms in the Ministry of Defence arsenal. During the early 1980s, the KGB leadership acknowledged that silent weapons did not meet all the expectations of modern requirements. The USSR Defense Ministry and the KGB ordered for its divisions and Special Forces a new silent sniper rifle capable of engaging the enemy, having its individual protective equipment for night-time conditions, with minimal give-away signs. That is, a sniper shouldn’t be given away by his weapon’s protective equipment or the clatter made by its action when fired. Work on the new rifle was assigned to the TSNIITOCHMASH factory located in the Moscow suburb of Klimovsk, which opened in 1983 as an experimental engineering development under the code Vintorez. The VSS was designed to hit targets at ranges up to 400 metres with special ammunition SP-5 and SP-6 subsonic bullets. Also, thanks to new rifle design decisions, when shot, the rifle did not make undesirable clattering sounds upon firing or other signs that would give-away a sniper. In many ways, the rifle’s good silencing performance when shot was provided by the so-called integrated, constructive input into the rifle silencer. In 1987, the VSS passed testing and was adopted by not only the military establishment but also the State Security Committee. The newest silent sniper rifle began to be used in Soviet Army service teams for special purposes and marine intelligence points. According to open sources, the KGB massively supplied the VSS only to the Vympel Special Forces Unit, which was to operate in the so-called gray period, conducting sabotage against the strategic infrastructure of a probable enemy and its military and political leadership. At the same time, Alpha focused mainly on conducting anti-terrorist actions, and thus the VSS was not as common among them as among their colleagues. 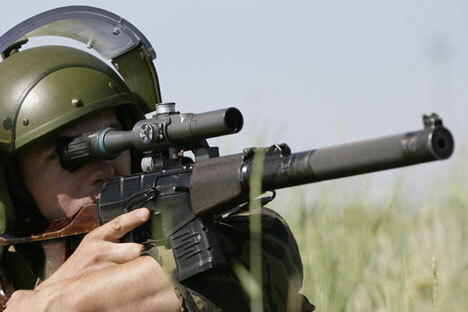 Interest in the new rifle was even expressed by the Interior Ministry, which planned to use the silent sniper rifle to arm the police unit already created for special purposes (special mission forces) and the special training battalion of internal security troops (which later became the legendary Vityaz special purpose squad. But the problem wasn’t immediately solved, and only later was the VSS given to Interior Ministry troops. According to some reports, the VSS was used during the war in Afghanistan, but based on reliable information, it is still unclear whether this is factual or not. Since the first Chechen war, the Vintorez was regularly used by Russian Special Forces in all armed conflicts. The VSS has now has ceased to be a unique weapon of the Special Forces, and is actively supplied to army scouts. “We use the Vintorez all the time, even more than the PK machine gun or the Dragunov sniper rifle. One very important point is that this rifle is compact, easy to work with in urban areas and in small space. The Dragunov has range, but to turn around with it is much more difficult,” an employee of one of the MIA Special Forces divisions said, sharing his personal experience. According to the source, in urban areas, it is rare to have to operate at a distance of over 300 metres, so he and his colleagues believe that the VSS is the perfect weapon in such cases. According to official Ministry of Defence reports, at the end of September this year, the infantry brigades of the Eastern Military District stationed in the Amur region will receive 15 Vintorez to arm their snipers. This is an abridged version of an article, first published by VPK News.